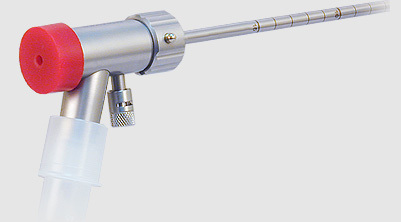 The rigid bronchoscope is an essential component of modern laser resection. We have developed a new bronchoscope. Known as the BRONCHOSCOPE EFER-DUMON®, this rigid universal bronchoscope and its associated stent placement devices are protected by several patents. It comes with a set of 9 interchangeable tubes of increasing diameter and two different lengths. 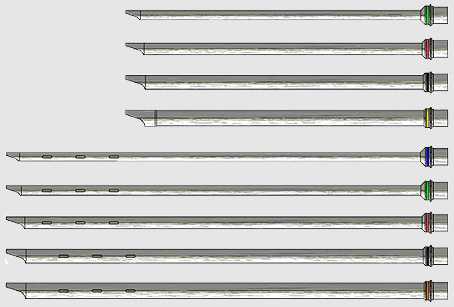 Five long bronchial tubes with side-ports for ventilation, and four short tubes, destined for the treatment of tracheal lesions, are available. A key feature of the short tubes is the absence of side-ports for ventilation. This feature precludes air leaking in the pharynx. Inner and outer diameters are engraved on each tube (6.50 mm to 12.20 mm for the inner diameters, which correspond to 7 to 13.20 mm for the outer diameter). In addition, the barrel of the rigid bronchoscope can be detached from the head of the scope thus facilitating tube exchange. 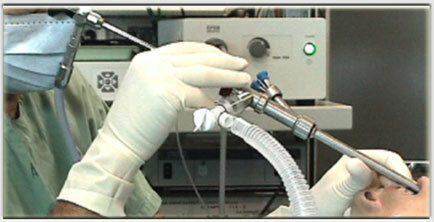 The bronchial tubes can be inserted through the barrel of the larger diameter tracheal tubes. 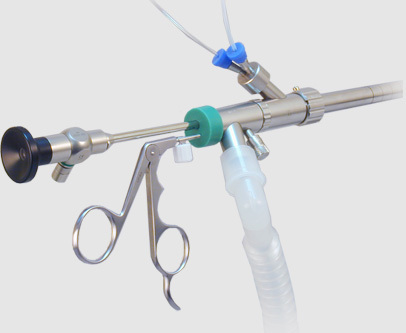 The BRONCHOSCOPE EFER-DUMON® system has a side-port with a removable cap. Most debris can be removed through it rather than requiring withdrawal of the telescope each time this is necessary. 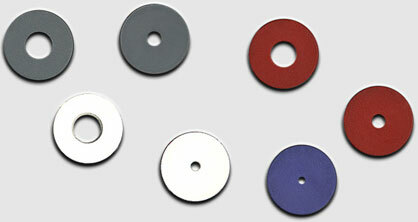 A set of silicone caps is provided with or without one or two holes so that all portals can be capped no matter what instrument configuration is being used. This instrument has been designed as a universal rigid bronchoscope system capable of adapting to virtually all foreseeable clinical scenarios. In addition to being specially designed for laser resection, it is an excellent instrument for diagnostic and therapeutic endoscopy in adult as well as pediatric patients. It can be configured with one to three ports, set up for open or closed circuit, jet, mechanical or spontaneous ventilation, and assembled with long and short barrels of different diameters. We have also designed a pediatric series consisting of tubes with and without ventilation side-ports. All of these tubes are 20 cm in length and have varying diameters ranging from 3 to 5 mm which are ideal for treating children. Although we favor avoiding jet ventilation, our bronchoscope does have an integrated jet ventilation connection. The design was kept as simple as possible. A light source attachment may be added, although the working channel is large enough to accommodate a telescope and other instruments. In order to increase the useful diameter of the barrel and facilitate removal of large fragments or debris, no guides for the laser fiber or suction tubes were placed inside the lumen of the rigid bronchoscope. The telescope is not attached at the proximal end of the bronchoscope, but rather rests and slides easily along the silicone cap. Thus, the lens can be extended for close-up inspection or retracted to protect it while applying the laser. Similarly, the laser fiber and the suction catheter are unattached so that all three components can be repositioned as needed. Usually the tip of the laser fiber is kept flush with the tip of the open tube, while the tip of the suction catheter is extended so that it rests just above the operating field. The telescope is positioned in the barrel of the open tube. Simply by turning the tube and/or moving it horizontally or vertically, the skilled endoscopist can accurately aim the laser beam.